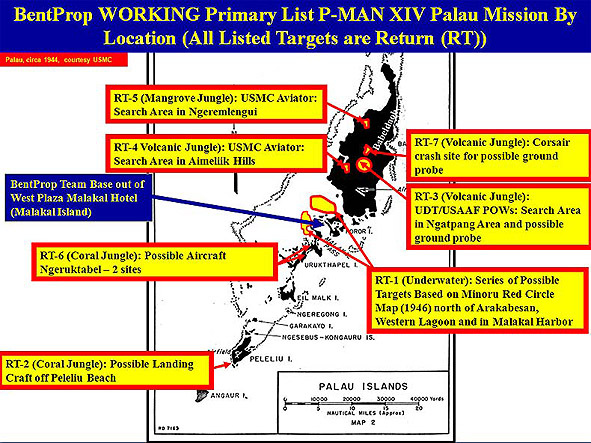 P-MAN stands for Palau - Marine, Army Air Force, Navy. XIV means this is the fourteenth expedition since we started numbering them (in 1999). A few months after completion of the 2012 expeditions, you'll be able to come back here to read the P-MAN XIV final report. Be patient. The 2012 BentProp team was in Palau 15 March – 15 April. For part of that time, we were joined by a team from the Stockbridge, Michigan High School Advanced Underwater Robotics Program. We'll give a special shout-out to anyone who can successfully say that rapidly 15 times in a row. The Stockbridge team brought a variety of remotely-operated sensors with which they helped us scan likely underwater targets that we've located via side-scan sonar over the past couple of years. While the 2012 expedition was under way, we posted regular progress reports (see below). Over the past several years many of you have become regular, eager, enthusiastic readers of the progress reports. Thanks for your interest and support! And thanks for being understanding on those occasions when we got behind by a day or so - there were times when there just weren't enough hours in the day, and we fell asleep before we could finish documenting the day's efforts. Part way through the mission, the Stockbridge kids decided to call their ROV "Dingar," a name suggested by the Palauans. According to the students at Palau High School, in Palauan it means alive or arisen. The ROV team had described the ROV to the Palauan students and explained some of the problems they experienced and how they fixed them. The Palauan kids said the ROV should be named "Dingar" because it had risen from the dead and was now alilve. 01 - March 11 - The teams prepare to leave for Palau. 02 - March 17 - Dan O'Brien arrives: BentProp 2012 now officially has boots on the ground in Palau. 03 - March 19 - Time flies when you're having fun. And waiting for Joe. 04 - March 21 - Flip arrives and gets some much-needed sleep. 05 - March 21 - Flip finds art in a bag. 06 - March 22 - Corsair! 07 - March 24- Data dumping; the ROV team from Michigan arrives. 08 - March 26 - Real science is fun - just not always pretty. 09 - March 26 - To Peleliu and back with the National Archaeologist. 10 - March 27 - The kids are learning patience and diligence. Lots of patience and diligence. 11 - March 28 - Ah, yes. The old "I-know-where-there's-an-intact-airplane-on-Ngeruktabel" trick. We fall for it every time! 12 - March 29 - The panther finally captures its prey. 13 - March 31 - ROV software issues and soil sampling with the President. 14 - April 01 - No joke: Sharp-eyed readers and aircraft ID teaching points. 15 - April 01 - Small plane reported missing Sunday evening in Palau. NO BentProp or Stockbridge people involved. 16 - April 01-02 - Derek arrives, everybody sees the Jake, and Dingar finally makes a deep dive. 17 - April 02-03 - Mixed alliterative bag: snorkeling, surgery, searching, sonar, soil sampling, and space odyssey. 18 - April 04 - The ROV's last mission. 19 - April 05 - Dodging the ciguatera bullet, and rubbing elbows with the movers and shakers. 20 - April 06 - The ROV team heads home. 21 - April 07 - We finally find a site on Ngeruktabel, and hold a moonrise seance. 22 - April 08 - Sometimes, Plan B isn't so bad. 23 - April 09 - Long mud hike delayed by van repairs; SSS work; Flip demonstrates his world-famous sunglasses trick. 24 - April 10 - The world's most grueling and satisfying jungle hike. Again. 25 - April 11 - Flip departs, Derek takes over Progress Report duty. Short, weird, deep dive. No-joy shallow dive. Warren picks up dinner by remote control. 26 - April 14 - Tagging and bagging, and a WAY cool (strictly business) outrigger canoe ride. 27 - April 15-16 - Dan wraps up loose ends and is left with an Empty Nest. P-MAN XIV is history. 28 - April 25 - A capital idea, presented at the Capitol: the ROV team briefs the the Michigan House of Representatives' Energy and Technology Committee.